Norma Velez and her partner made holes in the wall of their kitchen and tried for three days before finally rescuing a tiny, crying kitten trapped within. Norma Velez and her partner cut holes in the wall of their kitchen and made repeated attempts for three days before finally rescuing a tiny, crying kitten trapped within. 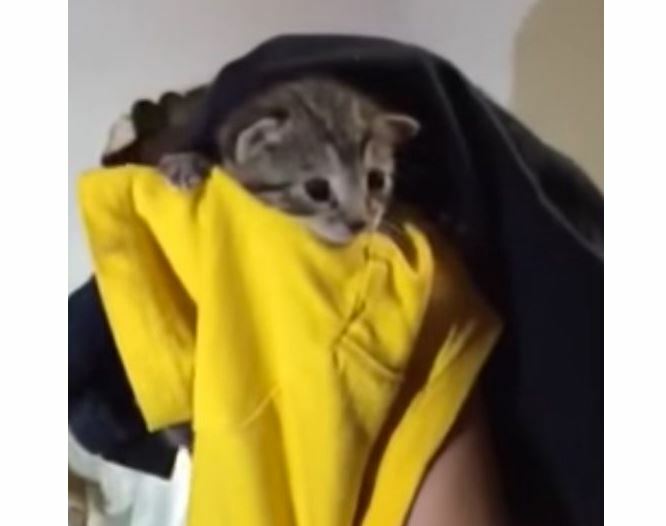 “This is how we rescue this baby kitten, that was that was trapped in between the wall[s] of my house,” Norma wrote about the video of the rescue she uploaded at YouTube earlier this month. “This baby kitten that was trapped in between the wall of my house for about 3 days, finally we rescue it after so much trying,” she continued in her introduction. The couple rigged a little sack into the openings they made in the wall and finally were able to use it to bring the kitten to safety. Norma speaks lovingly and reassuringly to the kitten and tries to make him feel safe after the rescue. God Bless these wonderful people who saved this tiny kitten. I hope they keep it! MOM again? this was a wonderful rescue!